Using the proper adaptor, can I plug my Smart ev to the NEMA 14-50 receptacle I use for my Tesla? Will the 240v, 40 amp output potentially damage the vehicle? 1. Using an EVSE that the Tesla uses and an adapter to the J1772 plug, will I be safe? Yes, this is fine. The J1772 charging standard has a handshake protocol where the EVSE (the thing attached to the house or the yellow corded thing that came with your car) advertises what it is capable of supplying and the actual charger (which is a permanent part of the car) adapts to that. This is no different than plugging a Smart ED into a Chargepoint or other commercial charger. 2. 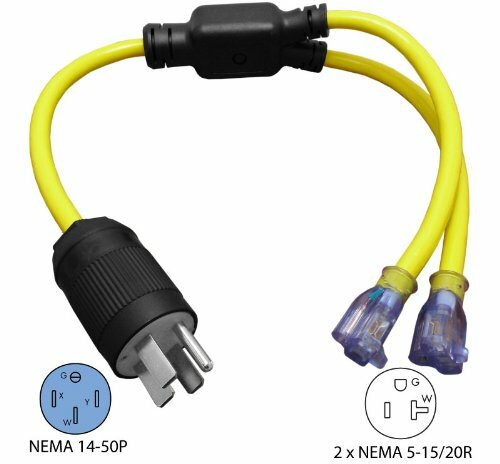 Using the NEMA 14-50, can I use an adaptor to plug in the Smart yellow-corded EVSE? This is also fine, just make sure you get the adaptor correct from the NEMA 14-50 to the NEMA 5-15 [normal household plug]. Never having seen the charger that comes with an ED, I guess it does not accept 240 V, so don’t just plug it in. I’ve seen someone crack open either a Leaf or Volt charger and figure it could support the voltage, then converted the plug. Of course Jim could be referring to a step down transformer which would then drop the voltage down to 120 V, which would then also work. If you have a Tesla specific charger, (acquired from Tesla), it is proprietary and I do not know a plug/adapter that will convert to J1772. (This won’t work with your ED as far as I know). Tesla makes an adapter for the J1772 to fit into the Tesla vehicle socket/plug. This would mean you have a Level 2 EVSE, and this will work with your ED. The ED may not use all 40A, but that depends on the vehicle to “decide” how much 240 V amperage to pull. I heard Tesla has an adapter to connect the car directly to a 14-50 outlet, but I do not have the pleasure of owning a Tesla and so this is just rumor mill in my mind. Do you plug your Tesla directly into the outlet? Maybe you can post a pic of how you connect it? That would help us a lot in helping answer your question. (Or you can post links to what you use as well). US electricity is 240VAC center-tapped to earth, meaning you get 240VAC across Line 1 and Line 2 and 120VAC across Line 1 to Neutral or Line 2 to neutral. There are readily available adapter cords (that do not have a transformer) from the 14-50 plug to 1 or 2 5-15 receptacles. Darn, I mixed up 14-50 and 5-50 again! Thanks for clarifying Jim!!! Also, 240 volts 40 amps is just the maximum output capacity of the supply. The amount of amperage a device draws which plugged into that supply (in this case, the Smart on-board charger - 14-15 amps at 240 volts) has nothing to to do with that. Last edited by Yinzer; 02-13-2019 at 06:37 PM. Thanks everyone for the great feedback. I guess I confused some with the Tesla reference. To clarify, I plug my Tesla into a regular NEMA 14-50 receptacle (the car came with that adaptor) I set up in my garage which I diverted from an electric stove/range 240v/50amp service that's no longer in use, I do not use a Tesla proprietary home charging station. My question is, can I plug my Smart EV daily commuter into this receptacle with an adapter that will not step down ot transform the 240v-50amp to 120v? I'm trying to get the fastest way to charge my Smart car, without damaging it by using this existing set up in my garage. My question is, can I plug my Smart EV daily commuter into this receptacle with an adapter that will not step down ot transform the 240v-50amp to 120v? I'm trying to get the fastest way to charge my Smart car, without damaging it by using this existing set up in my garage. Buy a Level 2 EVSE that will plug into the 14-50R (pick your favorite model/brand). The Smart 451 electric charger (the part in the car) is 3.3KW. The bundled with car 120V EVSE (with the springy yellow cord) can supply a little under half of that. I have not heard of people doing the 240V conversion on the factory EVSE (as is common on the LEAF charger). Without taking one apart (or verifying that the internals are the same as the European one), I wouldn't recommend that path. Instead, I'd Google or Amazon search for "14-50 level 2 EVSE" and buy something that you like from that list. Will run $225-800 or so and is totally plug-and-play (since you have the 14-50R already installed in the garage). You can (and IMO should) leave it plugged in all the time and use the Tesla's J1772->Tesla adapter to charge the Tesla as well. The Smart's on board charger (not the 120V adapter thingy) will work on voltages from 100 to 250 volts - provided that voltage goes through the proper charging station/adapter (EVSE) following the SAE J1772 standard. The slow-charging adapter that comes with the car is only for 120 volts (USA version) and is called a "Level 1" EVSE. A 240 volt EVSE is called a "level 2" EVSE. So, to use the Smart's charging adapter with a NEMA 14-50R, buy the adapter plug set shown in Jim Sokoloff's previous post, or if you have a bit of electrical DIY experience, build your own adapter with a MEMA 14-50R male plug from the hardware store and a short 15-20 amp extension cord with the male plug cut off. Make sure you get the polarity right - the shorter "slot" on the NEMA 5-15 female plug, typically fed by a black (or red) wire in the cord, is the "hot" side of the circuit. The longer slot and white wire is neutral. Green wire is safety ground. As others have suggested, if you have already invested in a Tesla, then for just a little more money you can buy a J1772 Level 2 charging station with a NEMA 14-50 plug and cord (i.e a range cord) attached to it. The Smart charges 3 times faster with it. I assume your Tesla comes with a adapter for a J1772 charging station, so you can use it to charge the Tesla too.